This November wedding on Treasure Island had the softness of a sweet fall morning, pastel flowers for a pastel sky, blush garden roses at their most open last glory of the year, a few last peonies saying goodbye to the year and a hint of eucalyptus saying hello to the winter coming. This quiet, subtle, beautiful wedding was stunningly captured by Elena Graham Photography, thank you for your talents. 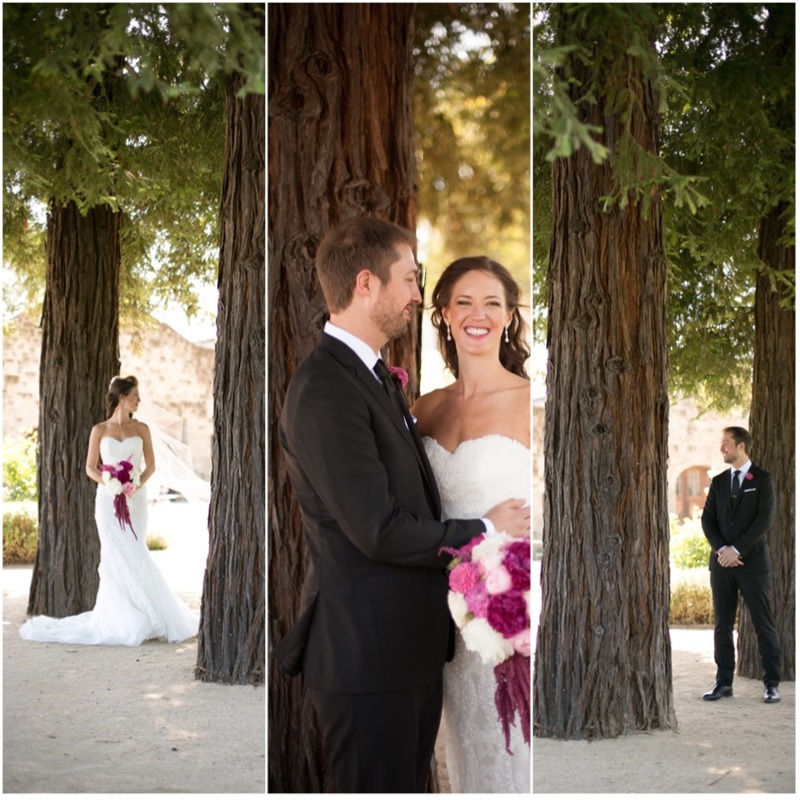 A jewel of a wedding at Tra Vigne Venue in Napa. The bride carried her favorite flower, orchids, adding to the sophisticated sweet tone of the day. A stunning bride, captured by Sabine Scherer Photography, thank you for capturing this sparkling day. This classic wedding at the iconic St. Francis Hotel shines in a golden glow of warmth, elegance and ambiance. What bride and groom would not want to have their memorable evening in this magical setting? This was a beautiful wedding in a stunning yet rustic setting of Soda Rock Winery in wine country, Healdsburg. Cheerful shades of pink added to the vibrant and happy setting. Thank you to Karna of KMR Photography for capturing the cheerful cherry hues. Thanks also to Heather Holliday of Holliday Weddings for putting together another smashing event. Sometimes you can't help but fall in love. The bride and groom, Cat and Alex, were so passionate about their upcoming wedding that I couldn't help but join in, our meetings were full of giggles. The bride loved purple and we were able to use dahlias, orchids, tulips and hydrangeas in a profusion of purples. The winery was the Old Almaden Winery, the first winery in California. The flowers helped create an elegant and magical evening in a very rustic setting. Thank you Juniperspring Photography for capturing the magic. It was an unforgettable evening and an unforgettable couple. Congratulations! The Westin St. Francis is The classic San Francisco Hotel, The Alexander Room classic glowing gold, but adding just a few touches of fall branches gave this wedding a bit if whimsy and the unexpected. Just a touch. It is always a pleasure to work at this hotel, and the view,oh my! Thank you Vero Suh for capturing this bride's unique vision with such loveliness. It glowed. The Mendocino Coast is always spectacular but especially in the fall and especially at Sea Ranch. The Sea Ranch Lodge provides a stunning setting, rustic, coastal and romantic, perfect for a wedding. It was a delight to put all of these elements together, an organic gentle gathering of flowers to compliment the space. David Austin garden roses called Patience, fall hydrangeas, olive branches, and silvery sea foam succulents helped give a fall harvest feel on the coast. A special thank you and shout out to Leslie Struble of Dandelion Events for putting this all together and to Elle Jae Photography for recording the beauty. And to Katie, a special lady and stunning bride. Ahh, what can I say. This is my family. I have loved Lindsay since I laid eyes on her, she was 6 months old. I have loved Jerry since I laid eyes on him, (a good deal later). I love love love weddings, I do this for a living, but there is nothing like being a part of the wedding, families, friends, merging to celebrate the union of two people that you love. Hip, Hip, Hurray! Bourbon and champagne, tattoos and lace, Lindsay and Jerry, a perfect marriage. Thank you Ryan Sin Photography. It is always fun to do a photo shoot, sometimes you get to play with elements that are out of the ordinary. This one at the Legion of Honor Museum allowed us to work with an unusually gorgeous bridal gown. The flowers played off of the swirling floral patterns. Thanks to Plumberry Photography for capturing this captivating spring day. This sunflower wedding at Kenwood Farms in Sonoma captured the spirit of the bride and groom perfectly. It was a sunny happy couple on their wedding day. Working with Erica, the bride, was so much fun. We incorporated a lot of her props, and mine, with the rustic farm to make for a casually elegant backdrop. We used farm fresh flowers such as sunflowers, rose hips and curly willow, all locally grown. This was one of my favorite weddings!